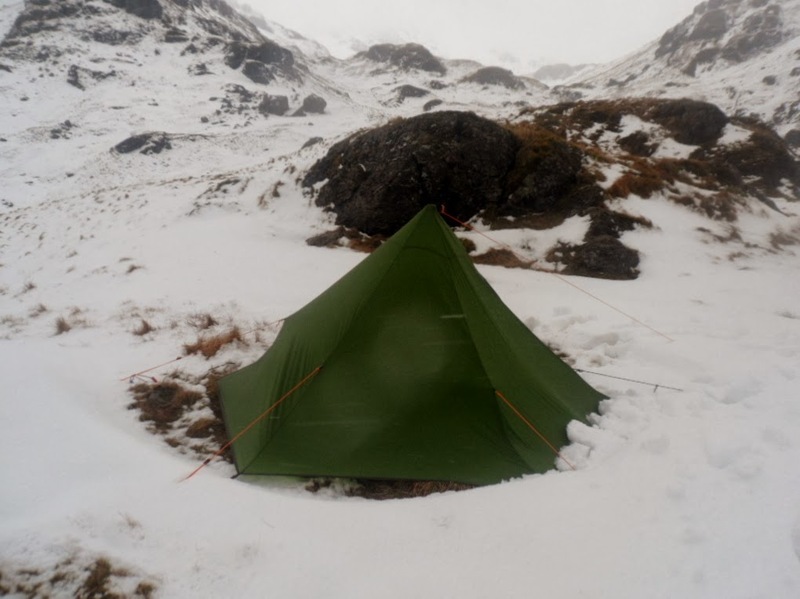 Extreme test for the Luxe Hex Peak 2014 – Summituphere? 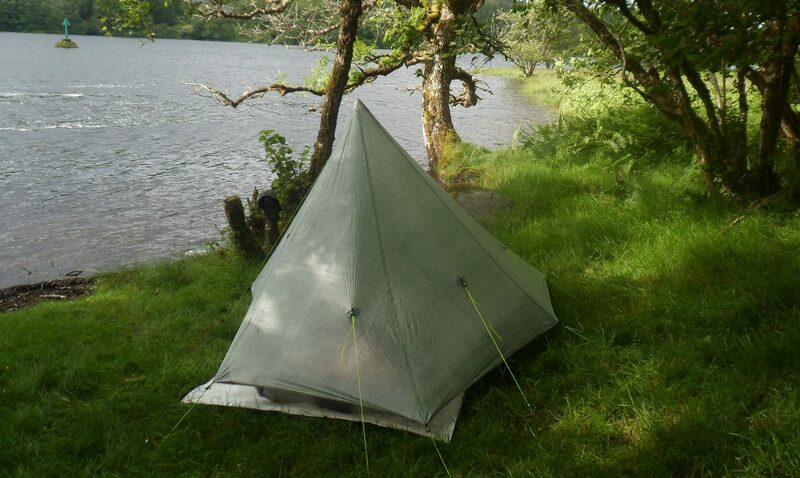 I would have double poled it in strong winds, but looking a top buy and for me Mids are the best shelters. Thanks for sharing that. A very informative report, in my view for mountain conditions I would carry stronger pegs. However, there is no doubt this design will withstand some harsh weather. Mine will be out this week, though the conditions will most likely be less challenging. 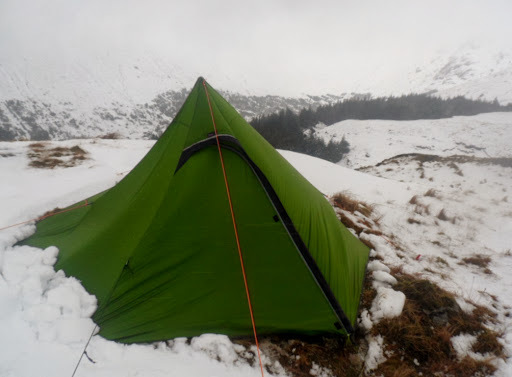 Hi Rob, I have the same tent and haven't yet tried it overnight but did pitch it in 40+mph wind WITHOUT the extra storm guys (which was a mistake) also some of my line locs were threaded incorrectly and didn't hold, which I have now rectified. It would be nice to have a clear material free top vent, but I bet when you are at lower altitudes in midge season you'd love it! How about a compromise at velcro fastend. That wouldn't add much to cost or weight. Did you peg the inner over the fly pegs. I initially didn't think of this but Bob at BPL put me right. This should then have stretched out the inner for you. I don't think this is an extreme wind shelter but it's nice to know it does cope. BTW, being an experienced Mid user I use a 130cm pole with a home made heath robinson pole extender- a 7″ piece of dry pine which weighs 60g. This means that the pole is not extended at it's maximum and much less likely to be damaged. It seems like Bob & Rose are on to a little cracker with the SilHexpeak. I agree with the first two comments – in tough weather double-poling is sensible and big pegs mandatory! And – all that space and strength for an amazingly good price. I also am thinking Alan looking at the photos if the top attached guy line added top down pressure under load to the pole along with side distortion from snow build up on one side ? Your engineering thoughts on this ? I don't think the top guy will make a huge difference, Martin. The main vertical load on the pole will be coming from the wind load, so Widu Thirteen's comment is appropriate. The load capacity of the pole is a function of the square of the length, and a 135cm pole is going to be considerably more flexible/less able to support a heavy vertical load, than say the same pole set at 100cm in a Trailstar. As well as the length being a factor, Widu is correct in that the overall capacity for the pole to resist bending is increased when shorter, as the pole sectional bending strength (on average) is increased significantly by the pole tubes doubling up a fair bit more than when fully extended. Interesting Alan and thanks. TS was bomber at 95cm and this could be lowered a bit in a storm. But well pitched, double pole and Clamcleat Tornadoes to peg it down and this is going to be so solid in a storm. It does look like an impressive little shelter for the price. I like the combination of TrailStar-type height and wall angles with fully-enclosed walls. They're on to a winner I reckon. What's the space inside like for tall people? I did read this earlier on before I tried mine, but didn't want to comment until I had used it, which I now have. I think the outer is top dollar. The inner has imo design flaws as per my blog. Needs elastic shock cord 2mm not static line. Tub not well designed for tension. Needs extra support adjusted with 1mm shock cord half way up that attach to outer like on Oookstar and also Laser Comp inner. I am going to try a higher pitch though. Then see if longer poles or even an extra dedicated tent pole from Bob so I can pitch at 138 minimum sort it out. As I said, I so want to like this shelter, and if I get inner to work it will be a stormer. I’ve found the best way of reducing the amount of slack material on the inner is to fasten the two front corners to the two front corners of the main fly’s staking points. Luxe have a video showing this and recommending it. This improves the tautness of the inner overall, reduces billowing and ensures good separation of inner and outer along the back wall (ie where the weather is usually going to be hitting it). Adding some shock cord to the tieouts of the inner is a good idea too – especially the front two given that they’re now stretching further forward. I love the Hex, and with these small tweaks haven’t had any issues with the inner. Great write up. Looks like a fantastic shelter.